Good morning, friends! I hope you had a lovely weekend! 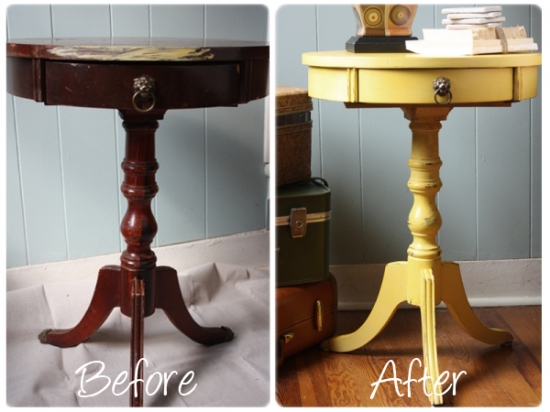 I’m excited to show you my side table makeover. I hadn’t picked up a paintbrush in far too long, so this project was incredibly therapeutic for me to say the least! I’ve been wanting to try chalk paint out for a while, so when a sponsor, Doozie’s Corner, contacted me about trying out CeCe Caldwell’s chalk clay paint, I jumped at the opportunity! A friend gave me this side table and it’s been sitting in our living room for probably close to a year needing a little TLC. I love how it turned out! Hello, scratches that not even furniture touch up could repair. 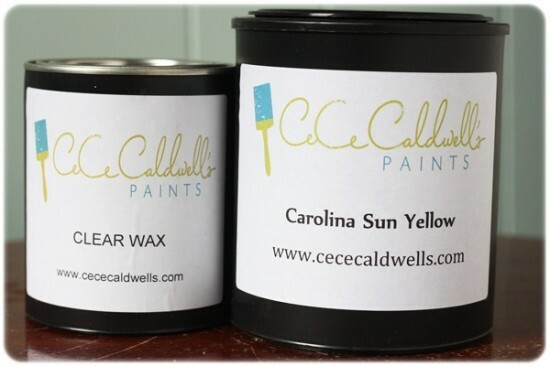 I used CeCe Caldwell’s Carolina Sun Yellow paint and the clear wax. I confess that I’d never waxed anything in my life up until this project, but it was so easy, and I might just be hooked. 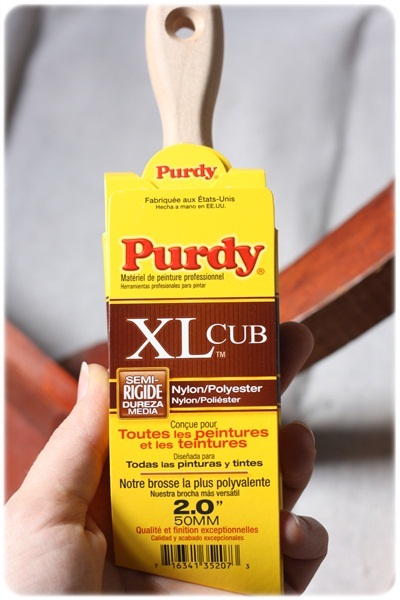 I used my very favorite Purdy brush. I gave the side table two coats of chalk clay paint, then after waiting a few hours I distressed the edges and sanded it down with my trusty sanding block. Two days later, I waxed it. The paint gave me a bit of a roller coaster ride because I wasn’t sure how it was going to turn out. When I first opened the paint and began painting it was bright…like really bright, but it dried a pastel yellow. After I sanded and distressed it was even more pastel. Uh, not what I was going for. When I waxed it, it was breathtakingly bright yellow-gold. Eeek! When the wax dried, I breathed a sigh of relief because the color was exactly what I imagined that it would be – a beautiful buttery yellow similar in intensity to my apple green desk. Ahh! I replaced the old drawer pull. Nothing’s more classic than a lion’s head, right? 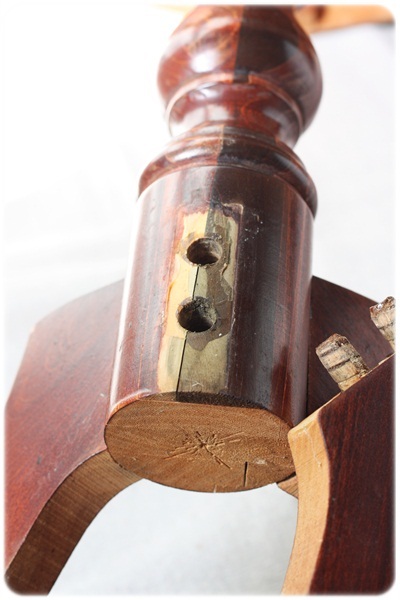 I love how the wax enriched the wood tones that came through the distressing. Here’s a closeup shot of the pedestal. 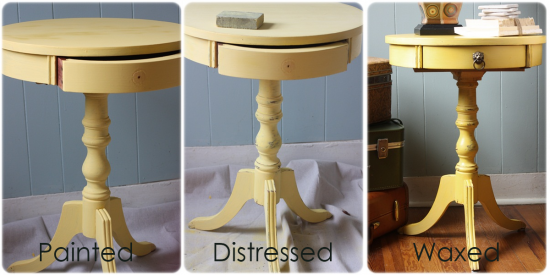 I really love how well the chalk clay paint worked for this side table. For now, it’s in the living room, but with the kids’ room makeover that I’m planning, it might end up in another space. 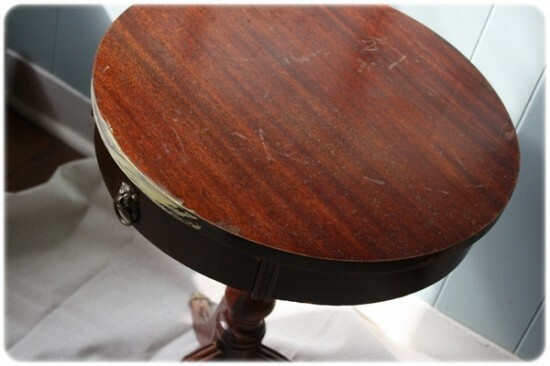 And that, my friends is a quick and easy way to makeover a side table. No priming, so sanding or prep work involved. Just whip out a paintbrush, can of CeCe Caldwell’s paint, a lint free rag and can of wax and you’ll have it made over in no time! Have you ever use a chalk type paint before? I’m linking up to Made By You Monday, Today’s Creative Blog, I’m Lovin’ It, Furniture Feature Friday, Weekend Wrap Up Party and Before & After Party! That’s gorgeous Myra, absolutely beautiful. I love that yellow! I love the color choice! 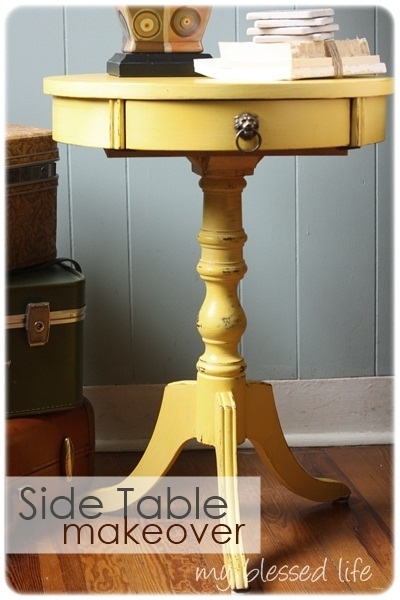 I’m looking to make yellow side tables for our master bedroom makeover. I’ve never worked with chalk paint before & I’m glad I read your tutorial first. @Ashlie, Aww, thanks Ashlie! 🙂 It was a fun project! The last piece I did, wow it’s been about ten years. I found an old desk in my garage which will become my next project. Your piece is beautiful. That turned out gorgeous! I just love yellow furniture. 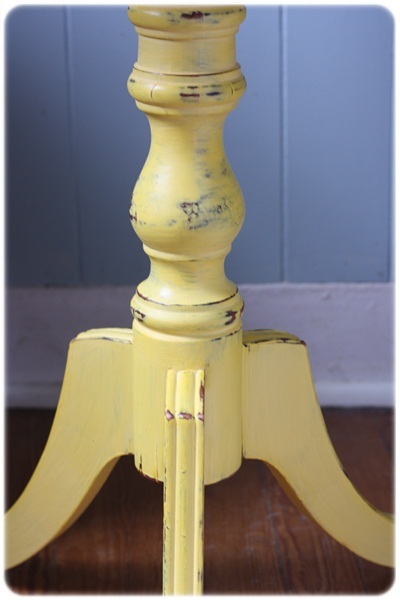 I painted the furniture in my daughter’s room a beautiful yellow and added crystal knobs. Wow- it turned out beautifully! I love the lion’s head- what a perfect, classic touch. I have to admit that I have just the piece that I’ve been itching to try some chalk paint on. Looks like it’s time to take that plunge! It’s beautiful but I have a silly question. When you say chalk paint, does that mean you could write on it with chalk or is it some kind of specialty paint? I’m a DIY novice trying to learn! Cheryl´s last blog post ..New York! @Cheryl, Good question, Cheryl! 🙂 Chalk paint has chalk as an ingredient versus chalkboard paint that you can write on with chalk. Does that help? I’m so excited about this! I have plans for repainting and redecorating our room and a guest room. I want to do yellow and gray so I was so happy to stumble upon this. The table looks fabulous. Thanks for sharing! I love it!! Beautiful colour and I love the distressed look!! Great job!! LOVE the new look! Fun color! I haven’t painted furniture in a while. I loved this, and my sunroom could use a little yellow. I have a table that could use a little TLC. And I am going to go for it. Thanks for sharing. Nice Job. Love the color – Inspiration for my three tables in waiting! Thanks! I love it! The color is so perfect!! Beautiful table, Myra! I just love it. 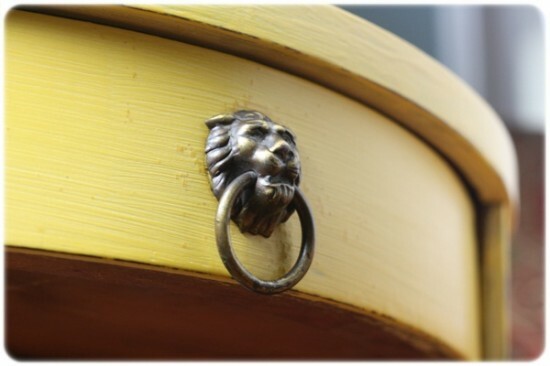 Love the color and so glad that you kept the lion hardware! Absolutely lovely my friend, that paint is a perfect color! You can use CeCe Caldwell’s Paints to make chalkboards. Just paint on three coats allowing them to completely dry in between coats. No need to seal or wax. Beautiful chalkboards, tabletop chalkboard, and even great to paint dresser drawers for a child’s room to create a fun piece of furniture for them to write on! Okay, my mother-in-law got me an amazing pie crust table that is begging for something amazing … this just might be it! Love the way your table turned out, Myra. Absolutely gorgeous! Love the color choice. This looks fabulous! The color really helps the hardware to stand out! Great job!! Very, very cool! The yellow matches the light blue wall in the background too. What a fun color! Love how it turned out! Found you on todays creative blog. Love that shade of yellow!! This turned out so pretty! I haven’t used chalk paint or wax yet, but I’m dying to get my hands on some!! What kind of wax did you use? I’ve never used wax to finish a project but I’ve love to get it a go. Ty in advance! So lovely! I love that color and you did a great job with that wax finish! Thanks for sharing! 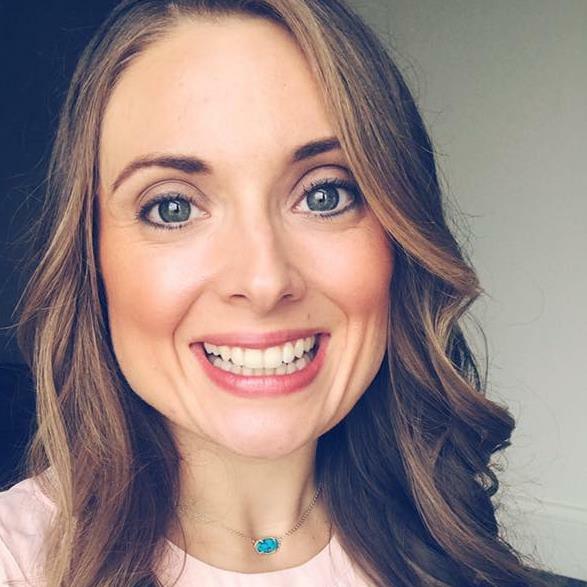 I love this makeover – I can’t believe the incredible transformation! I love, love this color. I also love CeCe Caldwells Green Paint. The wax is especially amazing…goes on like butter and best of all NO SMELL!! You did an amazing job. Great makeover. I love that yellow! I love that yellow color! Gorg! oh this is beautiful Myra….and yellow makes it even more beautiful!! TidyMom´s last blog post ..I’m Lovin’ It Wrap Up : St. Patrick’s Day Ideas & more! i love the table make over. Yes! No sanding or prep work is required. I just wiped down the piece so that it was free of dust and dirt. 🙂 Hope that helps! The application of wax truly transformed the look. I want to try this. I have a ton of stuff that could use covering up. 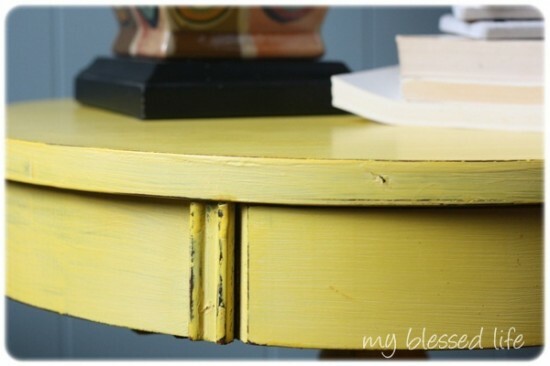 Love this yellow table and it sounds so easy. I would love to try this chalk paint on a small white side table that was picked up from a neighbors trash and sits in the bathroom. I think it would be so cute in the Sprin Green Hill. your little table is adorable. I always perfer paint to wood and am in a quandry now whether to paint an old mirror or not. I hopped over from Miss Mustard Seed’s Friday Furniture Freature party. Glad I did. Myra, what a wonderful splash of color to add to your room. I love your courage to mix the traditional design of the table with the vivid color. Thank you for trying our paints. I am pleased you enjoyed them. brilliant use of yellow…. and the lion’s head is the perfect choice. i, too, am hooked on wax after using annie sloan’s chalk paint. will be checking cece out now! I love how this turned out. Its so cute and the lion’s head was a nice touch! Oh! I love it. I have so many painted furniture projects I’d love to try, but I often chicken out and leave that stuff to my handy hunny. But since this requires no sanding, I might just have to jump in and give it a try. Im going to try this tomorrow! Can you help explain the destressing part of the project? Would sandpaper work? Great job and absolutely beautiful!! Thanks! I would love to try this paint!!! Where can I get some? Your table looks great! You did an awesome job. I have never tried CeCe’s or Annie Sloans paints but I do make my own, it is so easy to do! Just add some pre-mixed grout, about 3 tablesoons, to a quart of flat paint in the color of your choice (I use Ace’s Clark and Kensington because they have been giving away free quarts on the first Saturday of the month since March)Mix well and paint as you would with any chalk paint. No need to pre sand. Sand and wax as desired after dry. This is one of my favorite projects. I keep coming back and looking at it! The yellow is….. can’t think of the right word! 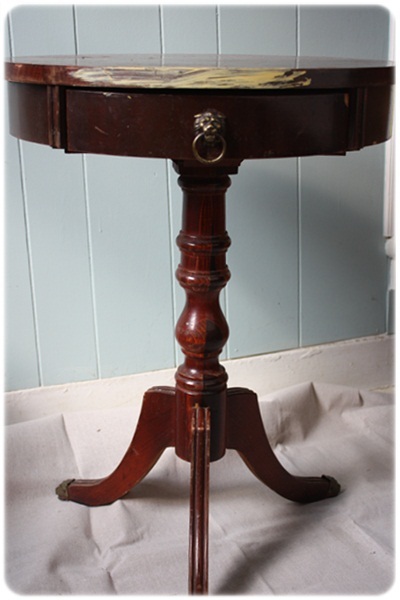 I have two of these exact same tables and have wondered food years whether or not I should paint them, now I know! Beautiful! Where can I find the chalk paint? What a wonderful transformation. Will definitely try this one out. I must compliment you on your beautifully written blog. 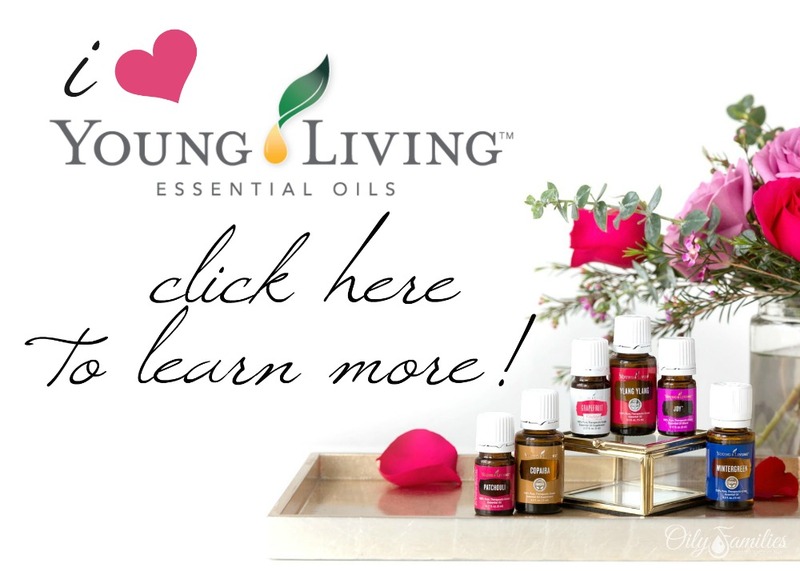 great read, I’m going to try to make my own and it made me laugh to read about the ups and downs of it being bright and trying soft and waxing bright…good to know! Love, love this color yellow. So warm.